- En route visit the Pinnawela Elephant Orphanage, home to approx 60 elephants. Watch the baby elephants play and bathe in the river; watch them being fed, or feed them yourself. 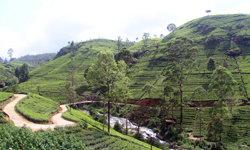 - Journey up through the hills, passing waterfalls (Ramboda Falls), pine and eucalyptus forests and vast green tea estates. Many optional photo stops en-route.